Ice fishing is one of the most thrilling sports anyone can engage in. It not only pushes your skills to the limits but also presents you with a myriad of unique experiences. Unfortunately, ice and snow can be really slippery and that’s why you only need to count on the best ice cleats for ice fishing. But before you settle for any pair of cleats, it’s important to first understand where and how you’ll use them. For higher performance conditions, you want to go for cleats with sharp spikes. These provide you with the extra grip to penetrate ice and snow. However, if you’re simply looking for cleats for short distance walks on ice, you might want to go for casual ones. Some of these can actually be used to walk on the floor. In fact, some of them come with retractable blades making it possible to use them in different conditions. If you still aren’t sure about the most affordable cleats for ice fishing to go for, we hope the following reviews will help you. And most importantly, we hope that you’ll love the pair that you finally decide to opt for. Safety is of great importance especially when winter comes calling. That’s because slips and falls often become a real possibility especially with snow and ice on the ground. 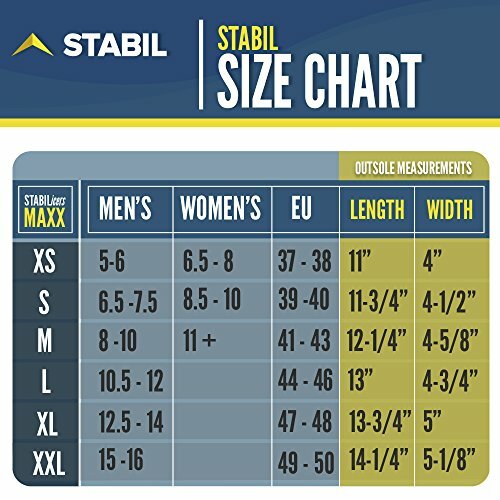 The table below is meant to ensure that you find the best cleats so you can take your mind off the weather! 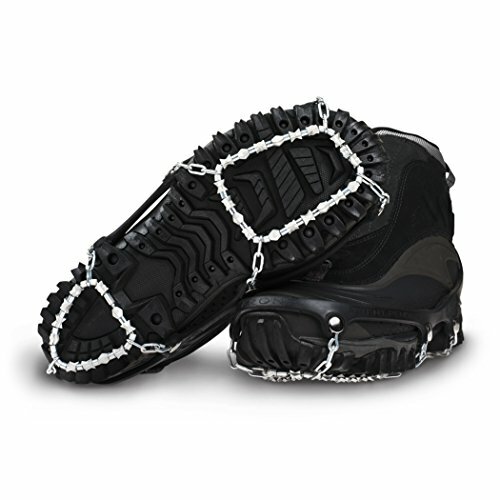 Stabilicers-Walk Traction Ice Cleats are high-quality cleats made in the USA. The cleats provide the best traction on gravel, ice and snow-covered pavement preventing falls and slips and are good for ice fishing. The cleats are made from a combination of materials including superior grade thermoplastic, rubber, and steel. The materials are flexible, which make the cleats quite flexible. In addition, the materials are lightweight so that you don’t get uncomfortable carrying extra weight on your feet or backpack. The material also is durable. The cleats are foldable and can be kept in your car, purse or pocket to use them only when needed. The cleats are easy to wear and remove. In addition, the cleats are designed to stretch to fit your shoes or ice boots using a tension fit system which ensures they fit well. Hillsound-Trail cleats are designed with features to deliver the stability and best traction for ice fishing. They are first and foremost easy to put on and take off for your convenience of use. 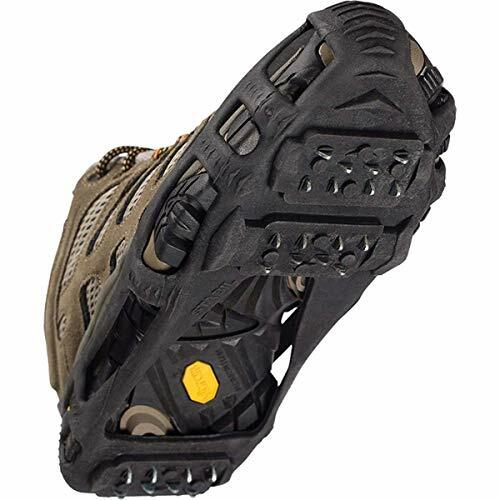 In addition, it has an elastomer harness which makes the cleat stretch to fit different sizes of footwear. Additionally, the cleats are made to fit perfectly on your boot due to the hinged plate which gets hooked to the sole of the shoes or boots. 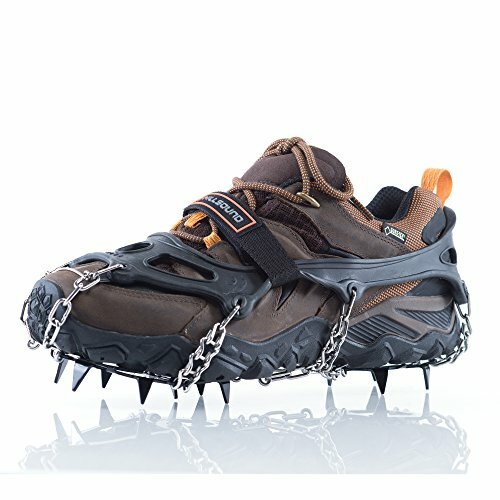 The cleats have spikes which grip snow to enhance its traction. The cleats also have an ergonomic plate to add spike stability. Stabilicers-Maxx Original will enable you to go ice fishing in the harshest snow weather. Using the cleats will reduce the risk of injury by preventing falls and slips associated with wet slippery surfaces by providing your shoes with traction. The cleats have heat-treated steel and replaceable cleats. In addition, the cleats have a full sole coverage which allows for a more natural walk. The sole is strong to withstand harsh conditions. Additionally, they have polyester fasteners to keep the cleats in place no matter how wet the cleats get. You can go on your ice fishing adventures with no hassles, thanks to the 360 degrees traction of Yaktrax Pro which provide stability in all directions on cold surfaces. The cleats have been proven to work in -41 degrees F temperatures. They are light for comfortable wearing and carrying. The pocket-friendly cleats are made from heavy-duty rubber and abrasion resistant, high-strength 1.4 mm stainless-steel coils. The cleats use rubber straps for a secure grip on your shoes. The cleats are available in various sizes to suit different users. As the name suggests, the cleats feature diamond grips to offer superior traction in ice and snow. The diamond grips also make them good cleats for gravel, rock, and mud. The cleats are made from casehardened steel alloy and come with a steel aircraft cable for a secure grip of your shoes. In addition, they have an elastic rubber sling which makes wearing and taking them off easy. The cleats have a self-cleaning mechanism and will never need to be washed. 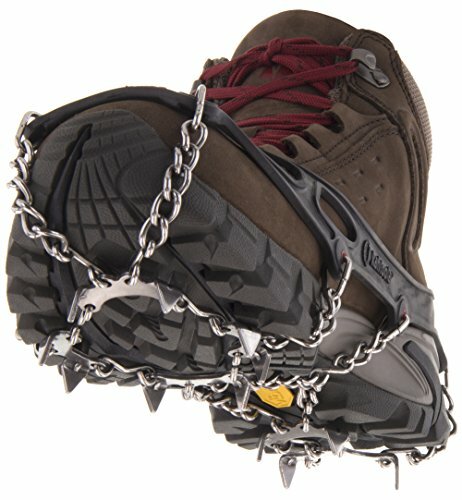 Kahtoola-Microspikes will guarantee you a safe ice fishing journey on wet sidewalks, rocks, snow, or ice. The units are designed with twelve cleats on each foot which provide the perfect traction on slippery surfaces. The cleats are made from high-quality materials. They are designed with tough elastomer shoe harness which eliminates the need for straps by providing a secure fit. The pocket-sized cleats can be conveniently carried in your car, purse, backpack or pocket. The cleats are made from heat-treated 400 series stainless steel, while the spikes are made from hardened stainless for durability. There are different sizes for different types of shoes and fittings. OuterStar Ice & Snow Grips packs many features to make a great addition to your ice fishing footwear. They are easy to wear and remove and can fit a variety of footwear including casual shoes, sneakers, and boots among others. The units are designed to work in temperatures as cold as -40 degrees. The units are affordably priced to suit most pockets. 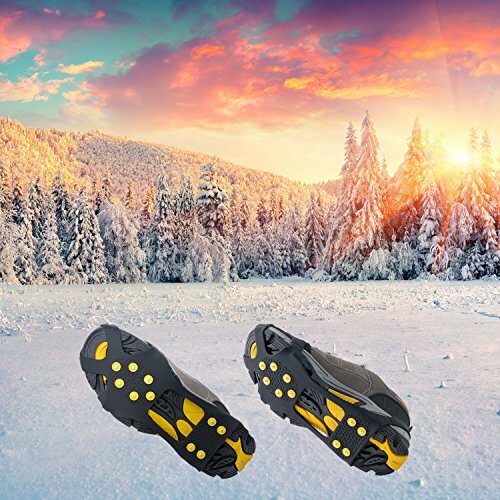 Additionally, the cleats are constructed from a thermoplastic material, which allows it to retain its grip and flexibility in harsh temperatures to prevent slipping. They also have non-slip steel studs to add to the traction of the units. In addition, the cleats are foldable and lightweight for easy portability. The first and most important factor to think about is the quality of construction. Basically, good cleats are ones with a superb gripping power, easy to use, and most importantly durable. Indeed, the last thing you want to buy is an ice cleat that can’t fully support you on ice. Likewise, you don’t want to end up with something that might fall apart after using it a few times. So, we generally advocate for finding cleats that boast a certain degree of mechanical engineering as needed to attach to your boots. Ideally, whatever you settle for should have straps and be flexible. Besides, it should be light in weight but durable – and that’s why aluminum cleats remain our preferred bets. 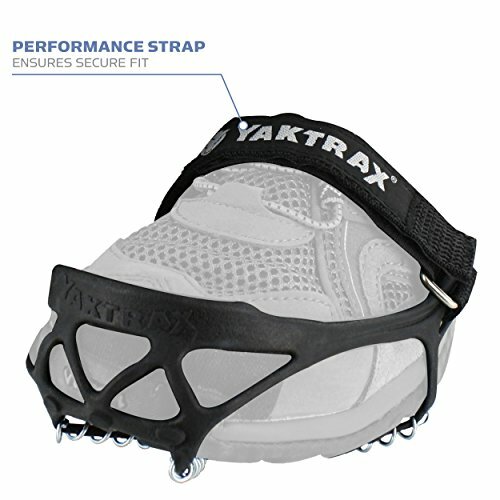 Our top-most preferred choice is the Stabilicers-Maxx Original Heavy Duty Ice Traction Cleat. That’s because it’s functional, durable, and most importantly versatile. We feel, that the Stabilicers generally present you with a deal that beats every other choice on the markets. Winters can be tough, but the good news is that with tough cleats, nothing can stop you. This is the best way to gain some serious traction and remain stable. So, don’t gamble with your safety get yourself the best ice cleats in the game and stand tall even in the toughest environments.